A friend of mine posted this recipe on Facebook and I was intrigued. I always struggle with finding good recipes for chicken breasts. I know they’re healthy–but I don’t like white meat and I feel like they always come out dry and bland. 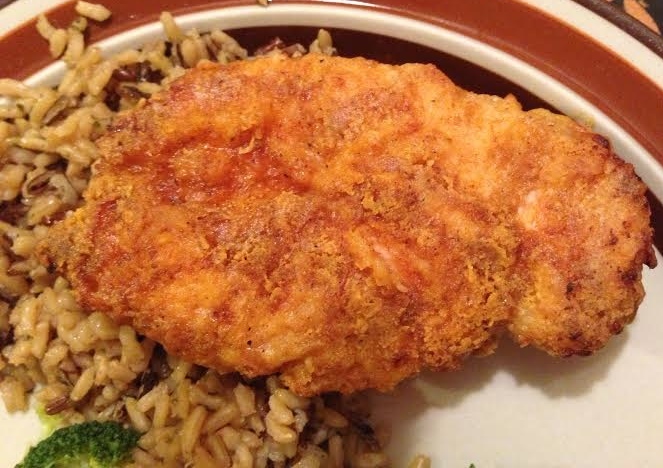 So by all means, if you have some good chicken breast recipes, please, let me know! At any rate, I gave this one a try and it was really pretty good. It was originally called KFC Baked Fried Chicken. I don’t know if it compares to KFC, but it was tasty. 1. Preheat oven to 400 degrees. Cut 1/2 stick of butter into a few pieces and place in a 9×13 pan. Melt butter in pre-heated oven. 2. Spread melted butter around the bottom of the pan. Lightly spray the pan, if needed, to make sure that there are no dry spots. 3. Shake excess milk off of chicken and completely coat each piece with the seasoning mix. You can either shake the chicken in the bag, until coated, or dip each piece in the bowl until coated. 4. Place each piece of chicken in the pan. 5. Cook for 20 min. Turn each piece of chicken and continue cooking for 20 more minutes, or until cooked through. Tip: I used skim milk and found the chicken to be a little dry, but not a deal breaker. A friend of mine suggested buttermilk next time. And I used chicken breasts and not the strips. It looks like it turned out great. My husband loves KFC, but I’m always looking for ways to cut the calories. This looks like a good compromise! I am a KFC fan as well, which is why I had to make this. It was sooo simple. Let me know what you think if you make it and if you use buttermilk instead. Good luck! I might try it this weekend, as I already have buttermilk in the fridge left over from baking bread. My husband is English and in the UK, the KFC has a thing called a Zinger Burger, which he loves. It’s a friend chicken burger, but it’s spicy. I might try to spice up this chicken recipe.